Jason Pennywell, representing Cooper Green Community Center, accepts holiday donations from the William E. Donaldson Correction Facility staff. Pictured left to right: Lt. Clinton Thrasher, Jason Pennywell, Warden Leon Bolling, Capt. Jeffery Baldwin, Capt. Terry Thomas, Brian Stutson. 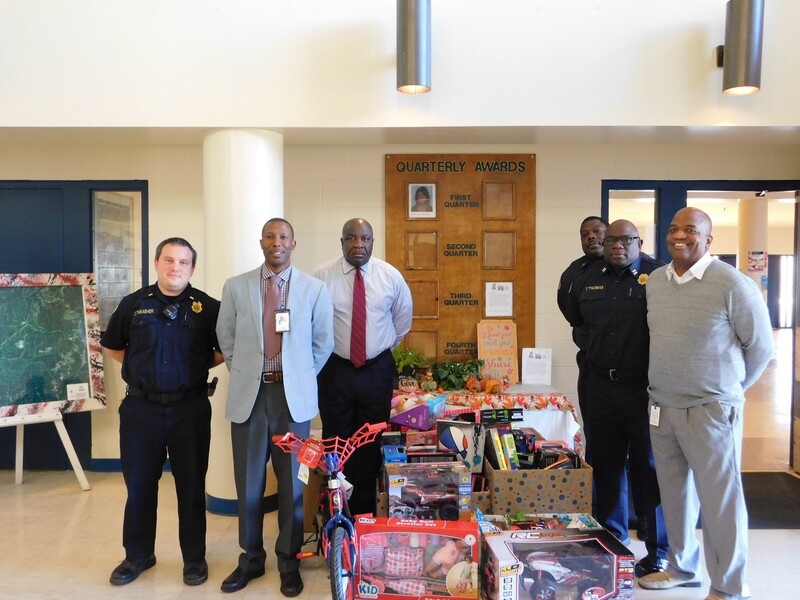 Officers and staff at the Donaldson facility spent the month of November collecting toys and other gifts that will be donated to the Birmingham Housing Authority’s Cooper Green Community Center. The donations will go toward the center’s 2017 Spirit of the Season Section 3 Program that provides monetary donations, toys, food and clothing to families that may be struggling financially. “By giving back to the community in a small way, our hope is to bring a little joy to children that may not receive anything during the holiday season,” said Warden Leon Bolling. Each year the community center sets aside a day during the holiday season to provide families with self-sufficiency resources, food, gifts and music.